How To Start Video / Live Streaming Marketing? Video marketing or live streaming are extremely popular nowadays. Facebook have rolled out their own live streaming feature in the native Facebook app. And there are Snapchat and Instagram that are making their way to woo more of their users to share content via video. For businesses, video / live streaming marketing is a good way to project a different experience and outcome for the audience. For starters, a video certainly felt personalized and more importantly, putting a real person behind content that they wanted to share. Here’s one very grave concern that most people faced. They don’t know where to start and it is really challenging especially when they heard about the high cost involved in video production. 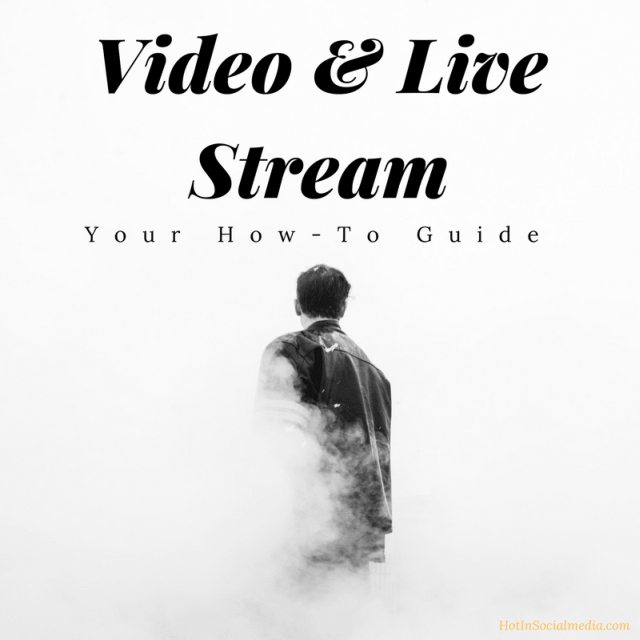 In this post, you will find simple ways to maximize your video and live streaming strategy with no (or a tiny fraction) cost at all. No one will ever consume your content (regardless how good it is written) if you are not sharing matters that they are interested in. In this case, it means that you need to understand your target audience; from what they want, to problems and challenges they faced on a daily basis. You can also try to discover what they truly want and in this case, it could very well be different forms of content. When you solve this question, it would be easier for you to start the next step (carry on reading). Choosing the right platform is important because there aren’t two platforms who work the same way! For example, Snapchat works by deleting the image or video after 24 hours. This means that if you are looking for posting once and recycling, it probably won’t happen anytime soon. Now, how about Instagram? Instagram Stories is available to everyone and it is a recap of what you had done in the past 24 hours. Your photos and videos will not be deleted and will forever remain there. When it comes to choosing the right platform for video and live streaming, it is always important to ensure that it is in line with your marketing strategy. Remember that if you are using a platform like Snapchat that deletes off the videos or images after 24 hours, you are required to constantly upload content on a daily basis. I know, this sounds a little bit odd but trust me, there are times where we enjoy originality. In this case, it means that you should always be as natural as possible in front of the camera. Why bother using software to make the perfect clip? Use your smartphones to capture the video and upload it! And if you really want to ‘touch up’ a little, there are inbuilt filters and editing features available in most social media platforms. Feel free to edit in any way that you like. Ultimately, I always recommend doing as little changes as possible to maintain a good level of uniqueness. Plus, don’t forget that with the amount of ‘noise’ in the market today, being yourself is a good way to stand out from the crowd! Generally, the interest of most viewers is very short. Unless you are going through a long tutorial, it is always advisable to keep the video short. Personally, I noticed videos performs very well the first few seconds where you have (close to) complete interest from the audience. As the time passes by, interest will reduce dramatically and you need to do way a lot more just to make sure you get the audience engaged. Therefore, planning your video in advance (at least a little) is always a good thing especially when you are hoping for results. Fun tip: Consider putting your core information at the very front of the video. This will ensure that you deliver value immediately after the video plays. Even if the viewer decided to leave the video right after that, they will leave with the information that they first required. Therefore, there is no shortcoming from your end in any way. Do you know that timing for publishing your video is beyond critical? For starters, you wouldn’t want to share a video in your pajamas at 3 am in the morning where there isn’t any audience available at the time. Or maybe, you wouldn’t want to upload a video while most of your audience are at work! Therefore, finding the right time for video publication is already recommended and definitely a must-do for me. Typically, consider uploading a video or do live stream during meal times or after work. Not only you will get a better interaction, you will be able to reach out to a wider range of audience as well. Thile there isn’t any specific data to prove this, you would need to try an error and gather information from your audience each time you publish a video. Check the stats (not all platform provides this) and perform several testings to ensure that you are publishing videos at the most optimal time. This is where nearly everyone goes on wrong. When it comes to video and live streaming, you need to be consistent. Consistency will ensure that you will reach out to a wider audience and your fan base will continue to grow! This is crucial because if you do not maintain the speed and momentum, your fans and followers will slowly leave your channel. It doesn’t matter if you are publishing on a daily basis or, doing it once a month. Keeping a stable pace is critical to ensure that your audience is constantly shared with information that will help them in their lives. Finally, the process of keeping up with the momentum is challenging. The best way is to have a content calendar and to ensure that you stick to the plans as close as possible. When this is done, you will find yourself achieving more than what you can do, while increasing the number of followers and fans.